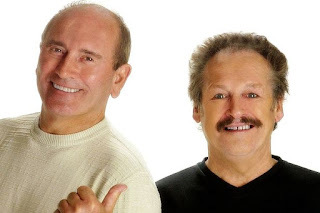 Tommy Cannon and Bobby Ball will be performing in the hilarious new play The Dressing Room, written by Bobby Ball, at Darlington Hippodrome on Tuesday 11th September. The Dressing Room is described as part play, part variety show - or as Bobby likes to call it a ‘play-riety’. With fellow comedians Stu Francis and Johnnie Casson the play is set in a theatre and promises to give an insight into backstage gossip and what the acts really think of the audience and other things that an audience would not usually get to see that go on backstage before each performer takes to the stage. On 18 May 1974 Cannon and Ball appeared on an episode of the variety show, The Wheeltappers And Shunters Club. Set in a working men's club environment, their act stood out showing a glimmer of what was hiding beneath the surface waiting to jump out and take the world by storm. By 1985 the duo were the hottest comedy act around. Now, in 2018, Cannon and Ball are the longest running comedy double act in Britain and truly deserve the title the Kings of Comedy. The Dressing Room is at Darlington Hippodrome on Tuesday 11 September.